​When Felicia graduated from Toastmasters International more than 15 years ago she had no idea how far she'd go as a speaker. If you're looking for a fiery, dynamic and heart-centered speaker then Felicia is definitely your choice. Contact us today for booking information. Today's woman is innovative, incredible and inspirational. Yet most are afraid of success and fortune. In this riveting talk about the power of an undefined women, Felicia inspires women to go beyond the status quo and use their experience, resources and instinct to blaze trails and overcome the obstacles women face in business. -How you start doesn't dictate you finish. -Why investing in yourself is ALWAYS the option. -What to do in order to PUSH past obstacles and cross the finish line in VICTORY. How to bring out your radical and remarkable leadership qualities that make you a relevant force in the business world. It's time to push forward and get outside of your comfort zone. Time to stop going from one conference or workshop to another to confirm what you heard at the last. You've wasted enough time contemplating and now it's time to get going on the vision you've got for your success. In this powerful and purposeful talk Felicia will take you on a journey of understanding how to unleash your inner Mogul and manifest your dreams of success. -The 7 steps to mastering your mind, heart and soul. The principles in this session allowed me to uncover my path to fulling my vision to bring inspired women together across the world, and find my own voice all while dealing with health issues, aging parent and raising a family. It allowed me to make the decision to go from being fearful to fearless, from being average to audacious. -How to bring out your radical and remarkable leadership qualities that make you a relevant force in the business world. 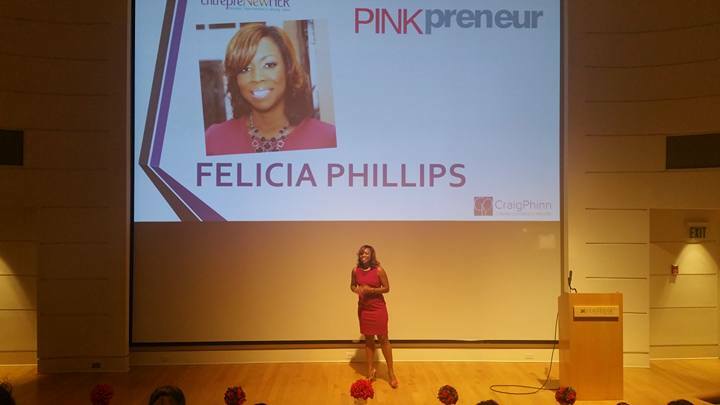 *Allow Felicia to help your organization or company customize a session tailored for your audience.